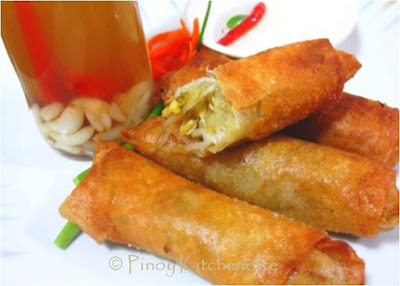 This is a favorite vegetable spring rolls of filipinos. Mung bean sprouts (togue) is often mixed with carrots, string beans (or locally known as baguio beans), cabbage and onions. There are also variations in preparing this. Some adds in tofu. Others put ground meat. But i like it more simple. Just the delish roll of mung bean sprouts, carrots, onions and sweet potato ~ and that's it! Sweet potato gives a nice complimentary taste with the other veggies. 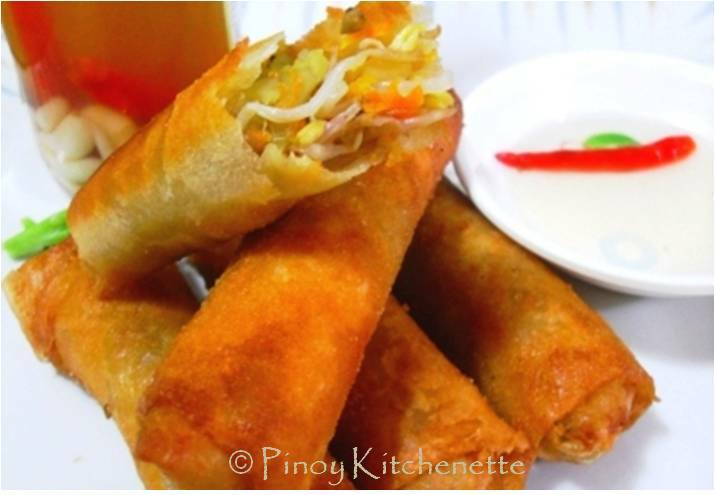 Lumpiang togue is actually one of Filipino's popular street food. 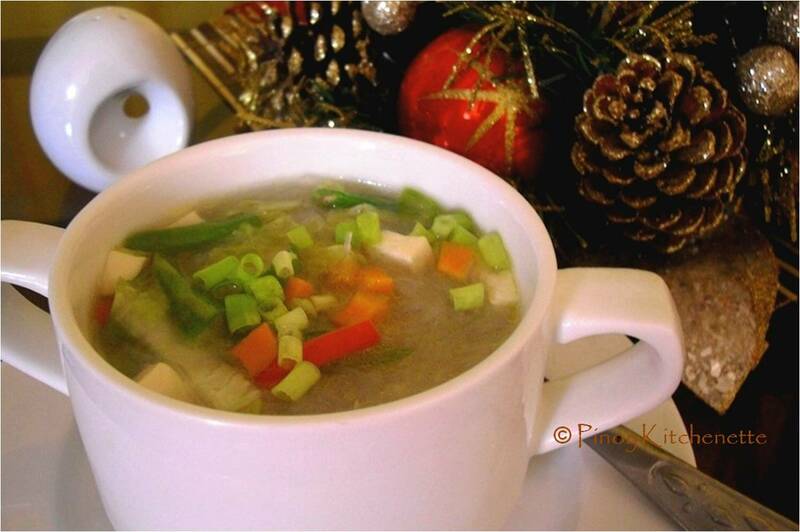 Most of the time paired with lugaw (congee). But one thing for sure, this spring rolls wouldn't be complete without its perfect spiced vinegar dip or what we locally call sawsawang suka. Wash mung bean sprouts in cold water. Drain well. Set aside. Heat about 2 tbsp oil in a pan, saute onions, add carrots and mung beans. Season with a dash of ground black pepper and salt. Stir fry vegetables about 3 minutes. Toss in pre cooked sweet potatoes.Turn off heat. Remove the vegetable mix from the pan. Drain excess liquid. Set aside vegetable mix. Let cool. Scoop about 2-3 tbsp of vegetable mix into each wrapper, roll and seal the sides. Deep fry each rolls until golden brown. Drain excess oil with paper towels. Serve it hot and crisp. Don't forget your spiced vinegar dip. Humba is a braised pork dish very popular in Visayan region. Interestingly, simple dish as it is, there's quite a variation on the ingredients in cooking this. 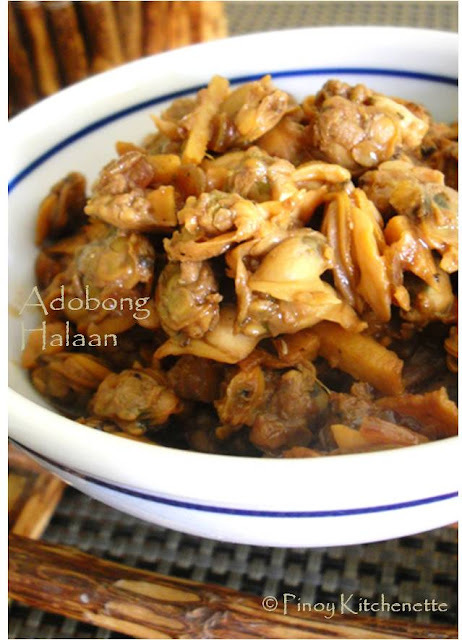 Most of the time, it is also mistaken as adobo (as it's also stewed in soy sauce and vinegar), but visayans wouldn't agree with that. I don't either, though how complex it may seem. Humba is more of the sweet side, adobo is to salty. Humba is also similar to Chinese Hong Ba. They kinda sound the same. Don't they? so maybe I guess, again it's of chinese influence. Add or minus some ingredients (from the authentic ingredients which i am not certain which is which) ~ Humba is definetely a proud distinct dish of its own. I used the kasim cut , ( I also like the pork knuckles for this dish). I like to add star anise, it gives a nice flavor. 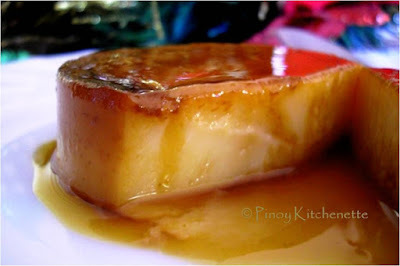 I made use of sangkaka I bought from my recent trip in bicol as the sweetener, instead of brown sugar. Two funny arguments have been raised when i prepared the dish. 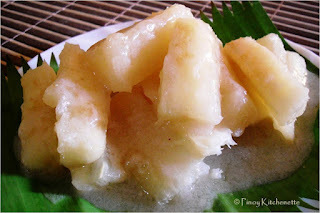 First is the sangkaka: I asked my mom, if it's made from coconut or palm, she said no it's not. She say's it's made from sugarcane. Now, I'm confused if i am to call it palm sugar. 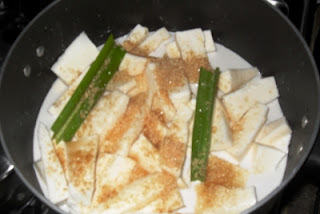 There are two kinds of sangkaka, the palm/coconut sugar (obviously from palm/coconut) and the unrefined whole cane sugar (also known as crude sugar). But then, after some deliberation hehehe, I decided it's the one from the sugarcane. so to avoid much confusion I'll leave it as sangkaka. Just choose which one you want to use, i mean~ really put into the dish. 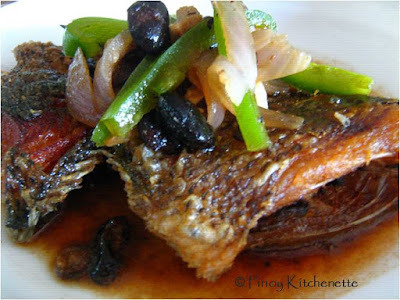 Second, the salted black beans: Humba is my husband's favorite dish, as he claims to be a true blue visayan and this is their regional dish. But he say's he's never seen his family put black beans into it. He was not quite happy of me adding black beans ,seems I desecrated a holy meal, Yay! But I think I was redeemed by the cupfuls of rice he consumed with it and a bowl of humba stored in the fridge (he kept and reserved exclusively for him), so I conclude I made a nice Humba. So how about you? 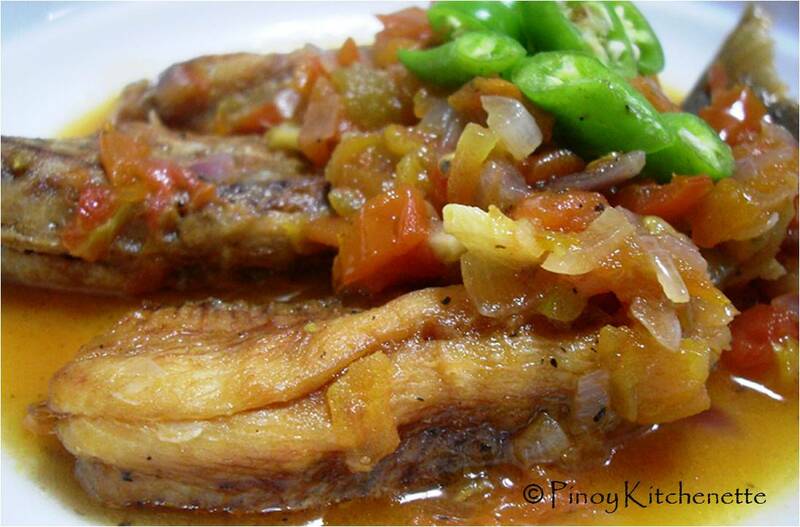 How do you make your humba? Care to share any tips? Wash and drain meat. Cut in pieces. Do not remove fat. 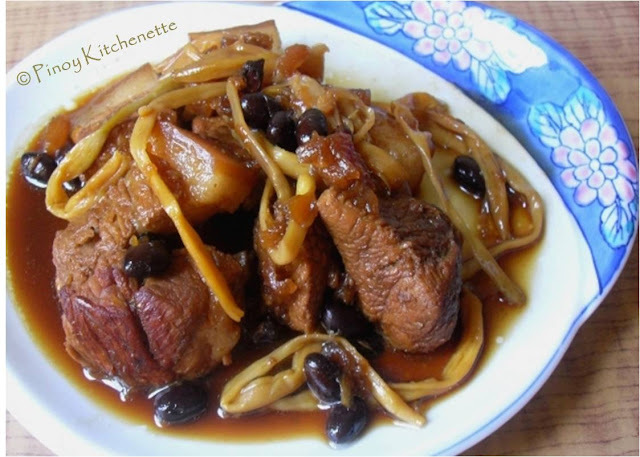 Marinate pork cuts in soy sauce,vinegar,garlic and peppercorns for about one hour. 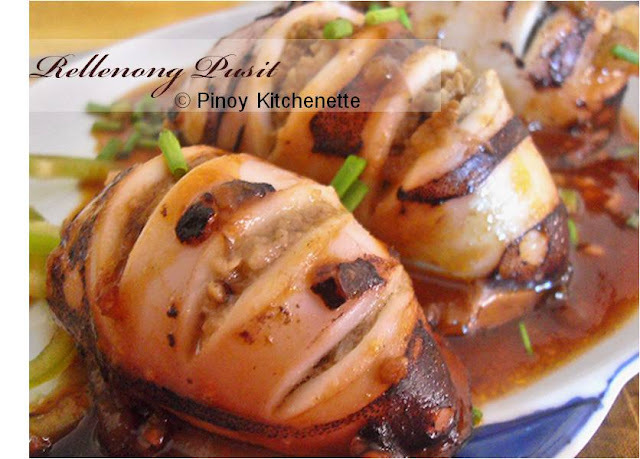 But if you have ample time in preparing this, better marinate it overnight in the fridge. Heat oil in pan.Brown each side of pork. In the process, pork will render its own oil. This makes the dish more tasty. Set aside pork. Remove some oil in the pan if it's too oily. Add the meat marinade, water, laurel leaves, star anise,pineapple juice and crushed pineapple. Let boil. Add meat and black beans. Cover and simmer for about 20 minutes. Then add the chunk of sangkaka. Let simmer in low heat until the meats gets really tender and sauce thickens. Then add the banana blossoms. Cook for 5 more minutes. I did not add salt anymore, the salted black beans was enough to flavor. Add some hard-boiled eggs if you prefer. Serve with rice. And just like any other braised dish, humba tastes great as lefover. Enjoy! Have a great weekend Foodies! 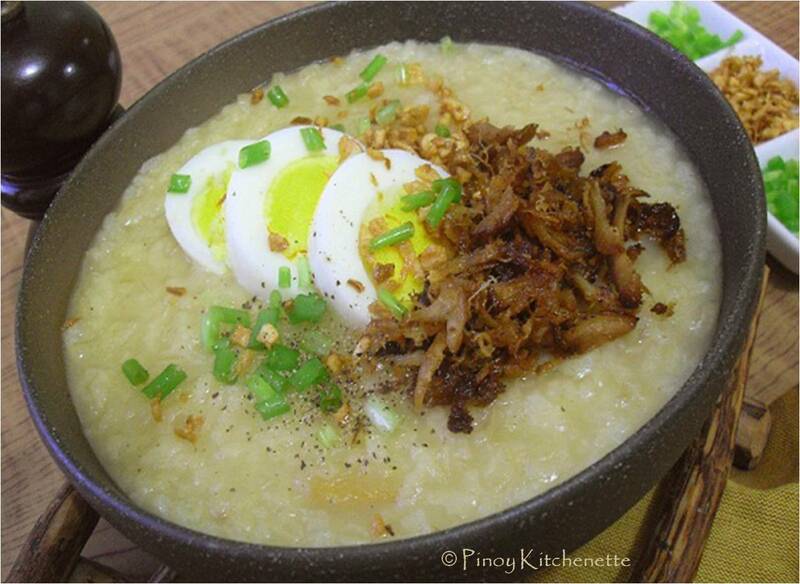 This month's theme for the Kulinarya Cooking Club is the well-loved classic Filipino Arroz Caldo. Since I have already posted an Arroz Caldo recipe sometime July this year (see: Arroz Caldo) , I decided to add a bit of twist to the original. And that's no other than adding crispy adobo flakes. I have some left over chicken adobo from yesterday, or shall I say I reserved half part of it hehehe since I've been thinking of putting some for today's arroz caldo. 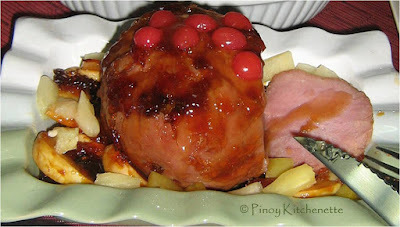 I would want to come up with something different coz this is my very first Kulinarya entry. I want everybody to like it, as much as me and the whole gang (meaning: my family) loved it. The adobo flakes gave a nice flavor on it, as what i have imagined it. Today's arroz caldo is so perfect, so comforting. The sun is up outside, but the wind is really chilly. Grrr! lamig! But nevertheless, this is a food that you can eat any season, anytime of the day. Enjoy! Over low heat, toast the garlic in a pot. We want it nice golden brown. When done, remove the garlic from the pot. Set aside. On the same pot, same oil, let the adobo flakes turn into our desired crispy flakes (but not burnt) so keep on stirring for about 5 minutes. Remove the chicken flakes when done. Set aside. On the same pot and same oil , saute ginger. Add rice, kasubha and chicken broth. Cover and let cook over medium heat. When it boils, lower heat. Stir and season with fish sauce. Let simmer for about 15 minutes, but stir once in a while to keep rice from sticking on the pot. Best served when hot. Top with eggs, spring onion, toasted garlic and adobo flakes. I was able to have a 2-day short visit to Bicol last week. With route from Manila-Legazpi City- Tigaon - Nato- Naga City then head back to Manila. It was a not planned visit, so K (my sister), Pia and me went on a back-packing trip (literally, as we each had a backpack of our own with us, with just a few stuff and nothing much). We decided to have Legazpi City as our first stop, since it was a nice sunny day and it was a perfect time to a have a view of the majestic and beautiful Mayon Volcano then head on to Nato beach. And dear oh dear! While my daughter was so thrilled playing on the sands, my eyes feasted and widened with delight on the sight of a newly caught blue marlin being sold in the pier side. Would you believe, the price of it was 4x cheaper than in manila market? Yes! seems I hit a jackpot! P100 for a kilo versus P400 per kilo in manila. So I bought a few kilos as my "pasalubong" for my mom. I planned to have it for kusido and fish steak. Since I have a brand new sizzling plate, nothing else comes to mind but to make a sizzling malasugi steak. A heaping of rice serving came with it. We all enjoyed the dinner. Sarap! Oh by the way, we call it Malasugi in bicol, in tagalog term it is tanguige and blue marlin in english. 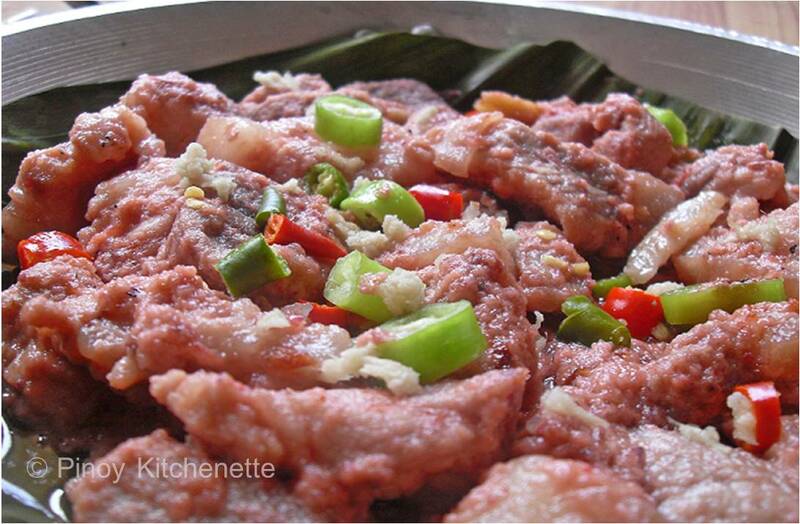 Pat some salt and pepper onto each side of sliced malasugi. 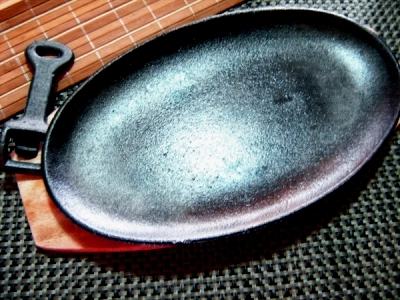 In a non-stick pan, heat oil. pan-fry the fish. Cook and brown each side for about 3-5 minutes. Set aside. In the same pan, saute onions with a little oil, then add soy sauce, calamansi juice, brown sugar and water. Season with salt and pepper. Simmer uncovered for 3-5 minutes. Add dissolved cornstarch to thicken the sauce. Turn off heat. 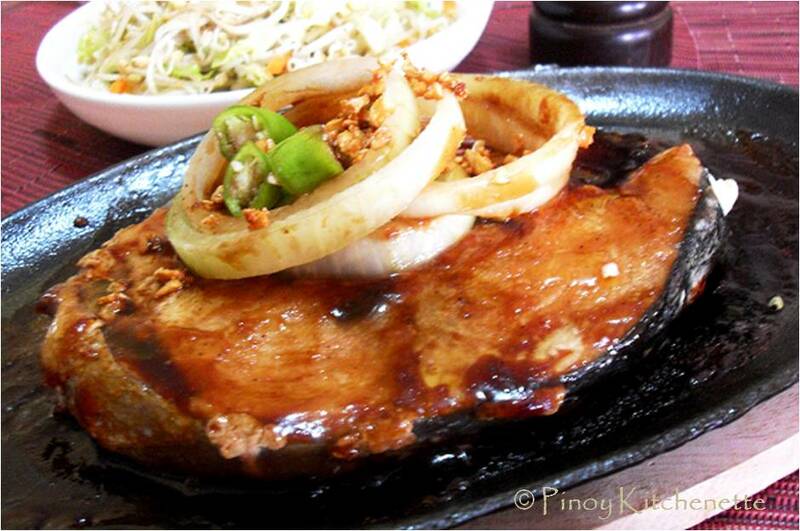 In a heated sizzling plate, place the malasugi, pour sauce, then add chilis and toasted garlic for garnishing. For proper use of sizzling plate click. I think Pinakro is a bicolano dish (I assume), as my non-bicolano friends haven't heard of it yet. I practically grew up knowing Pinakro as one good merienda to have. > Peel the cassava. Wash. Chop to pieces- about 2-3 inches long and an inch wide. 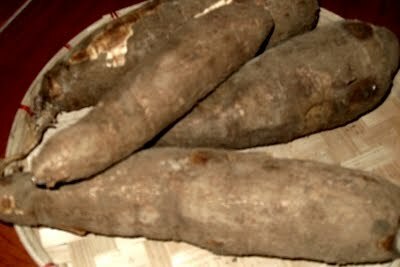 > Place the cassava in a pot. Pour in the coconut cream and milk,salt and half cup of brown sugar. Add pandan leaf for a nice flavor and aroma. Cover and cook in medium high heat.Let boil. > Reduce heat when it boils. Add the rest of the sugar ( add some more if you prefer). 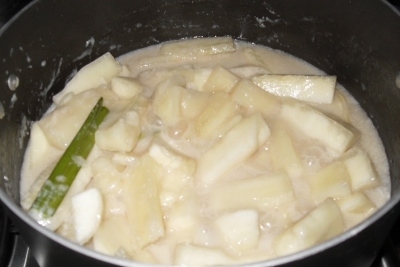 Cover and cook until the cassava is tender and the sauce thick. > Can be served hot or cold. 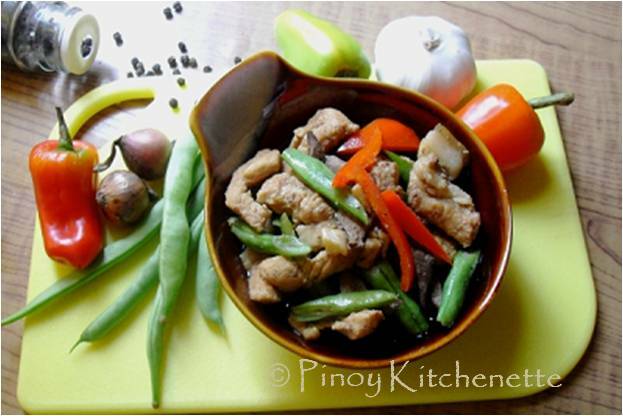 As I've mentioned in my previous adobo post, Filipinos can cook almost any vegetables and meat adobo-style. 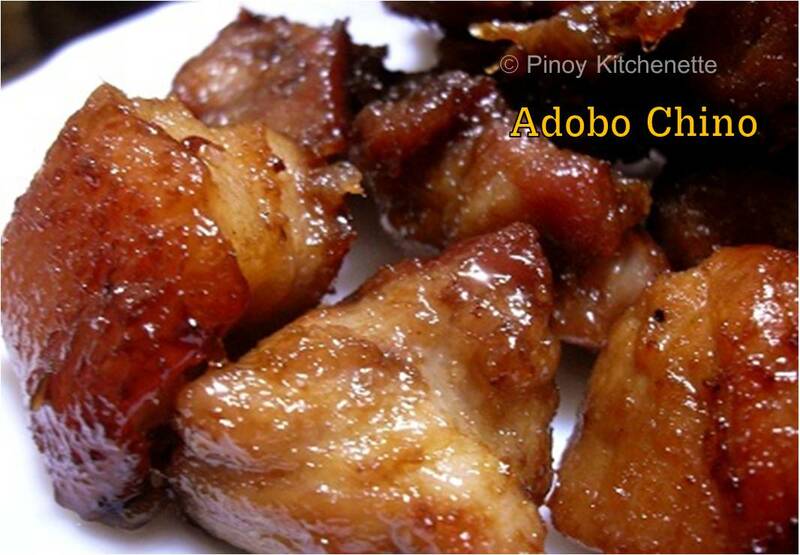 Indeed, Philippines is rightly to be called the Adobo republic. 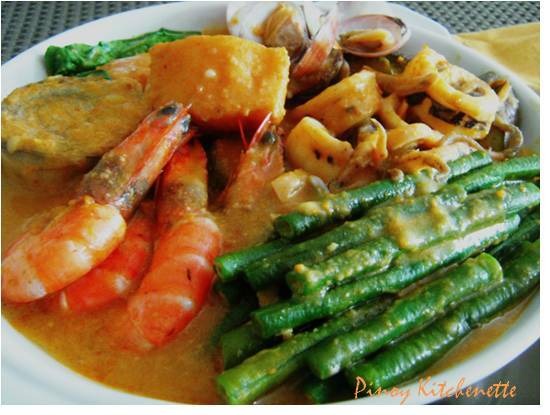 And we are so fortunate of having rich seafoods being an archipelagic country surrounded by vast water. We have so many white sand beaches we can boast of... so many places to explore and visit, imagine we have 7,107 islands... been to about 20 I guess? Now going back to Adobo! Here's another one you should try, Adobong Halaan (Clams Adobo). This is very easy to prepare and doesn't take much time to cook. This is another favorite dish i like. It's so tasty. My sister bought 2 kilos of fresh clams from the market early this morning. She's been bugging me for days to cook this adobo. She just came home from the US and she's been craving for filipino foods, and this one tops her list. Place the clams in a pot. No need to add water, it will produce its own broth. Cover and cook until the clams opened up it shells. Turn off heat. Remove shells from broth. Set aside the broth for later use. Let the clams cool, then remove from shells. This makes about 2 cups when shells are removed. In a pan, heat oil. Saute ginger, garlic and onions. Add soysauce, vinegar and clams. Add about 4 tbsp of broth. Season with pepper. Cover and simmer for about 3-5 minutes. You may add 1 teaspoon of hot sauce (optional) for a hot spicier taste. Enjoy! Serve with rice. This weeks sponsors are Pink Memoirs and Postcard Enthusiast. Weekend Blog Follower Caravan is an online blogger-helping-blogger weekly meme, a big help for bloggers (especially the newbies)to help each other in terms of blog followers through Google Friend Connect, email subscribers Twitter and Facebook. For more details on how to join the fun, simply click this. 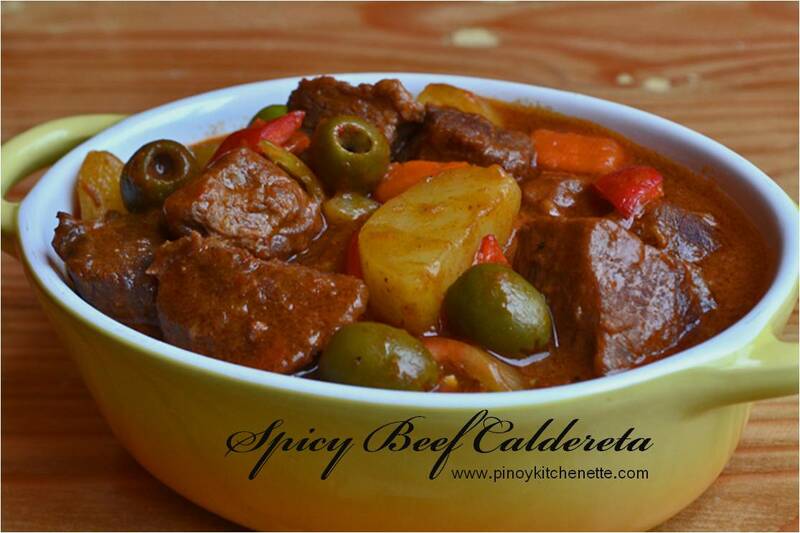 And here's my facebook page Pinoy Kitchenette. 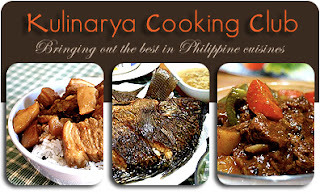 or https://www.facebook.com/PinoyKitchenette LIKE IT..LIKE IT..! 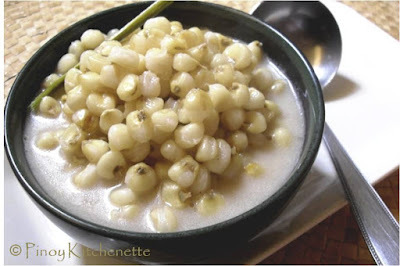 "Binatog" is a popular filipino snack, wherein white corn kernels are boiled and cooked until they burst out of their skin. 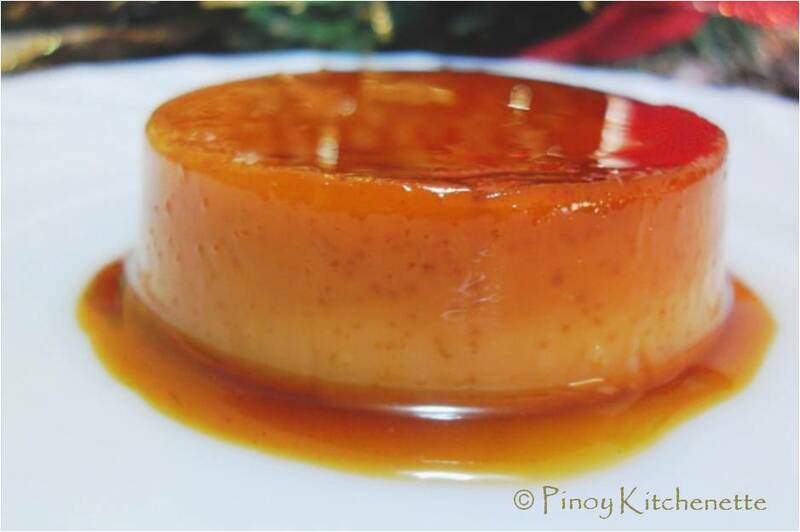 Often served with a bit ounce of evaporated milk, sugar and grated coconut as toppings. But the recipe i'm sharing here is a more delicious variation because it is cooked with coconut milk instead of just plain water. Can you imagine the taste? It's creamy and sweet yes! In a pot, cook the corn kernels with water. Add salt. Let boil and cook until very soft and kernels are bursting. Add more water if needed. When the corn is cooked and water almost dry, add the coconut milk, sugar and pandan leaf. 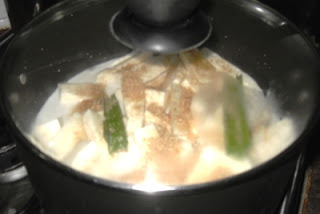 Let boil for about 10 minutes to cook the coconut milk. 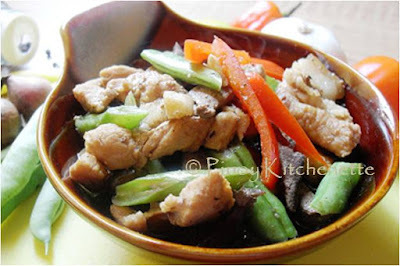 Kinunot is an exotic dish of Bicol region, found in the southern part of Luzon. Kinunot or kunot in bicolano term literally means shredded. What makes this dish particularly interesting? We use the meat of baby shark or sting ray. Would you dare try that? Have you tasted that already? Well, If you'll ask me, I've had several servings of it for many times during my growing up years, and living just a few kilometers from the sea, there's a bounty daily supply of seafoods. And I tell you, both meats (baby shark and sting ray) are so tasty. It is cooked with coconut cream and malunggay or moringa leaves. I remember that before shredding the meat, it's boiled first with vinegar or calamansi juice, to rinse off stench. But I think catching baby sharks and sting rays nowadays is being prohited. So you wont be seeing it sold in the market here in Manila. If you have reservations in eating this dish, don't worry... with the recipe i'm sharing here, I've replaced the baby shark meat and sting ray with that of Cream dory fish (though it's a bit bland). But the recipe came out well. So you might want to try this. You may use any other fish fillet you want. 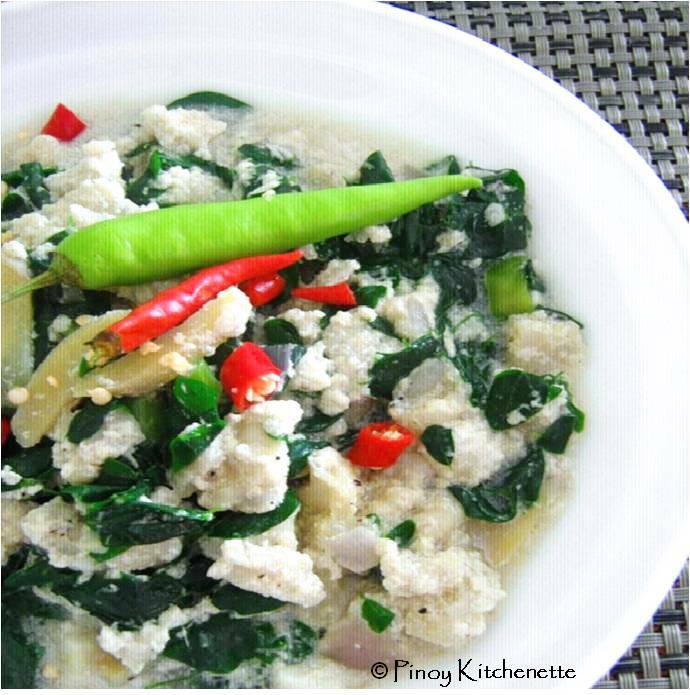 Shred the fish fillet (no need to boil it, since the meat are soft), the add calamansi juice into it. Set aside. In a pan, mix together the coconut cream, ginger, onions and garlic. Cook over medium heat, while stirring continuously to avoid curdling of the cream. Let boil. Then add the green chilis and the fish meat. Cook for about 5 minutes uncovered. Season with fish sauce and ground pepper. 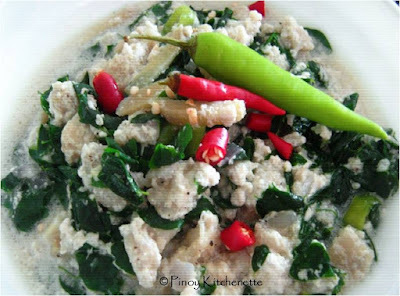 Add malunggay leaves. Cook for another 3 minutes. Transfer in a serving plate. Garnish with more chilis (optional). Serve with rice. Enjoy! We live near the lake, so we have an abundant supply of fresh tilapia. My daughter likes it cooked -deep fried with a heaping of catsup on the side. Me? I like it deep fried too, but with black bean sauce. 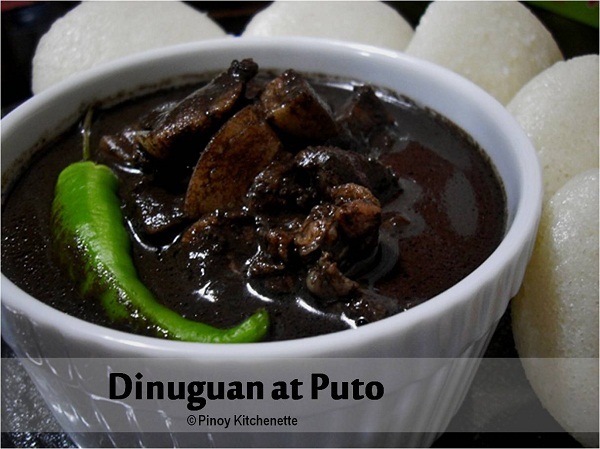 Tausi or tawsi are fermented black beans and are available in cans or pouches here in the Philippines. Tausi is already salty so you have to be careful in adding too much on your dish. Wash and clean fish. Cut into 2( if desired). Drain well. Rub with some salt. Deep fry fish in heated oil. Then set aside fish when done frying. 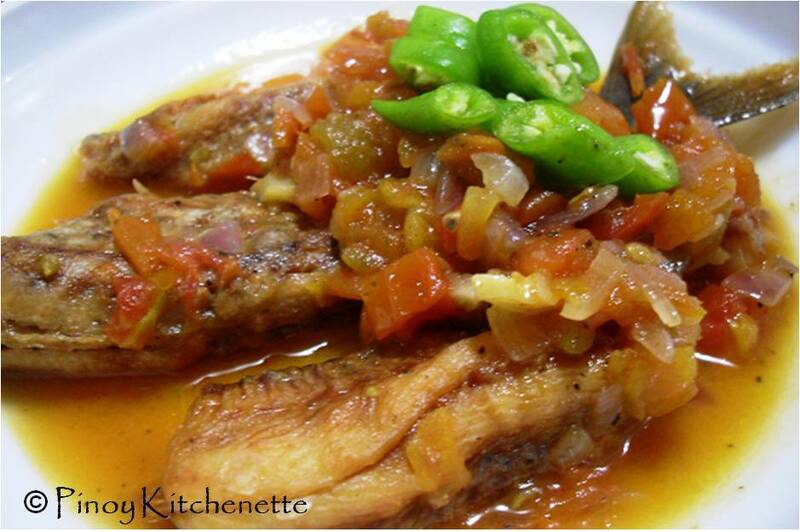 While frying the fish, heat 1 tbsp oil in a pan. Saute onions, garlic,add ginger, then the salted black beans. Add water. Cook for about 2 minutes. Add the bell peppers, sugar and ground black pepper. Adjust the taste, add salt if needed.Simmer for another 2 minutes. Pour the sauce on top of fish. Serve with rice!